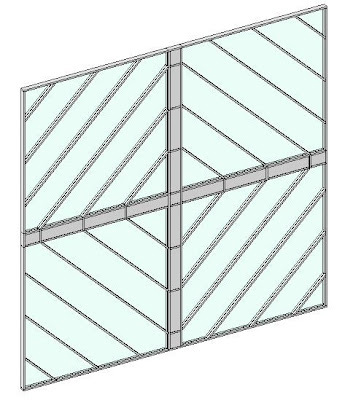 Revit Fix: Curtain walls within a curtain wall. Curtain walls within a curtain wall. Ok, this is not a special trick. As mentioned in one of my previous posts, with a curtain wall, you can select a panel and using the “Type Selector” and change it to a curtain wall. The above image is an example of this and it would be useful in the event you want some of the mullions to go in a different orientation to the main grid. I would say before you even do anything like this, make sure your other project team members are aware of how you are doing it. For someone to try to edit this with-out understanding it will result in a lot of frustration and swearing.